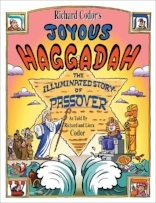 Need Haggadot? Borrow them from the Jewish Community Library! If you’re in the Bay Area, you can borrow a set of up to ten haggadot matched to your needs. Materials must be picked up at either the Jewish Community Library main branch in San Francisco or at the Library's Pushcart branches at the Palo Alto and San Francisco JCCs. For more information or to order, email library@jewishlearningworks.org or call 415.567.3327 x705. Materials are limited, and are available for loan on a first come, first served basis. The following haggadot are lent free of charge by the Library. Contact us to learn which is the best fit for you, or click on each title to learn more and to see page previews. In collaboration with the Kesher Marin Family Concierge and The PJ Library® in San Francisco, the Peninsula, Marin and Sonoma Counties.